Spreader beams, lifting beams and magnet beams are below-the-hook lifting devices that lift loads with single or multiple attachment points. They act as a crosspiece for spacing the hooks or chains that hold loads such as bundles, rolls, cylinders and machinery. Multi-purpose spreader beam used in a hydraulic excavator assembly plant. 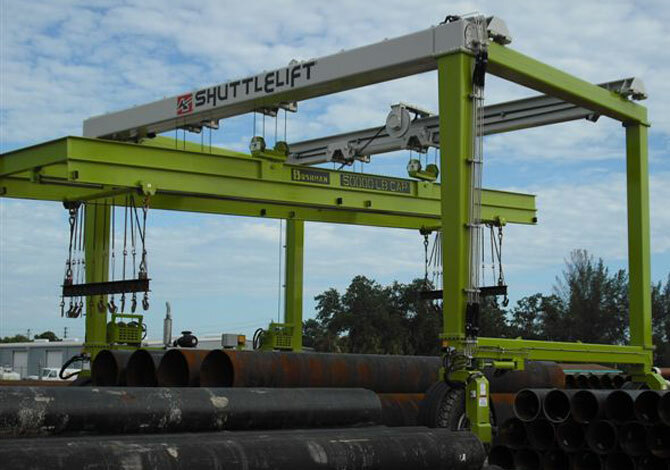 Bushman Equipment, Inc. has great experience designing and building heavy duty material handling equipment such as lifting beams and spreader beams for use in primary steel mills, steel service centers, pulp and paper mills, power plants and in difficult environments with varied crane layouts. Bushman® spreader and lifting beams are designed for safety, durability and simple operation. All Bushman Equipment, Inc. lifting devices are designed and manufactured in accordance with the latest revision of ASME Spec. B30.20 and BTH-1: Design of Below-the-Hook Lifting Devices. A wide variety of spreader beam models are available in many different design configurations. Left: 15,000 lb capacity Model 439 spreader beam with two swivel hooks. Right: 250 lb spreader beam with pipe grabs and twin chain legs connected to a master link. 20 ton adjustable spreader beam with integral storage stand and 5 swivel hooks. The load bearing hooks on this adjustable spreader beam can be moved to multiple locations. 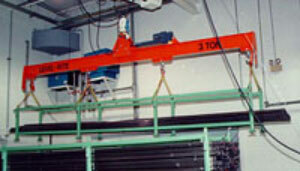 The standard load beam includes three lifting centers. More lifting centers are available upon request. Left: 150 metric ton adjustable beam with single hook and twin-hook lifting bails. 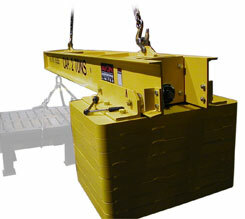 Right: 13,000 lb capacity multi-adjustment beam with manually adjustable lifting bail for lifting unbalanced loads. Model 413 – This spreader beam is used with slings. The beam is equipped with formed round bar J-hooks at fixed locations. The formed hooks minimize the potential for damage to the sling assemblies. Multiple sling location points are the most common option selected by users of this load beam. Safety latches are available with sling hooks. Left: Beam with sling hooks. Right: Spring loaded safety latches available for sling hooks. Model 490 – This is a chlorine cylinder lifting beam designed for fast, efficient handling of standard chlorine cylinders (80-3/4” to 82-1/4” long per Chlorine Institute). Maximum capacity is two tons (4,000 lb.). 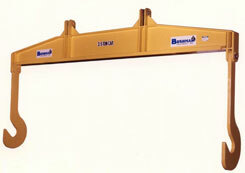 Model 415 – This Bushman® spreader beam features fixed or pivoting plate style J-hooks. This type of lifting beam is used for paper roll handling as well as handling cloth and plastic film rolls, and ladles of molten metal. The beam’s hooks engage the shaft or mandrel that extends from the roll. Right: 5 ton manually rotating spreader beam with sling hooks and a center swivel hook. Bushman® motorized rotating lifting beams have fully powered rotation with controls that can be integrated into your crane system. 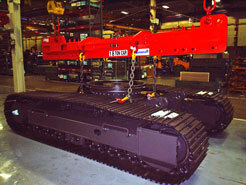 Bushman Equipment, Inc. builds motorized telescopic magnet beams with controls to suit your requirements. 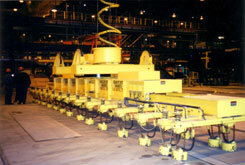 This 15-ton, fixed length magnet beam is attached to a twin-hook overhead traveling crane. It supports four electro-magnets that lift bundles of pipe. It has built-in chain hooks and a center swivel hook for auxiliary lifting functions. Magnet beam attachment plates include replaceable hardened bushings. Burn table plate handling magnet beam. 50 ft. long beam supports 10 magnets and has an integral storage stand. The Level-Rite® load beam can balance or level your load after the lift is made. Controlled by the operator from a hand held pendant or radio control system, this Level-Rite® beam will reduce handling time by eliminating the need to adjust the load to do a balanced lift. The Level-Rite® is available on many of our products as an option, making it one of the most versatile lifting devices available. The Level-Rite® can also be used to tilt a load which may be required for precise placement or assembly operations. Manually operated Level-Rite® beams are also available. Two-ton Port-A-Bar with adjustable counterbalance custom designed to reach into a seven-foot deep opening for installing or repairing an air conditioning unit. 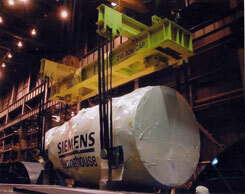 This 230-ton capacity spreader beam lifts a multi-million dollar turbine. 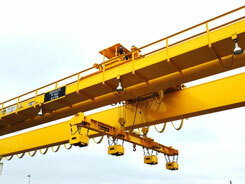 This spreader beam is custom designed to pick up engines with two cranes. 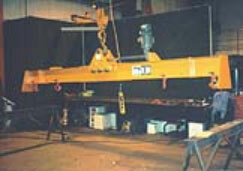 Hydraulically adjustable spreader beam used with an outdoor rubber tired gantry crane.